Our Philly Mission Kids have linked up with Surge for Water (surgeforwater.org) and POPOW (of Kabermaido) to help bring clean water to a small village in Eastern Uganda. The Agroi Spring. Through book sales and fundraisers, our Philly Mission Kids have raised $730 of the $2,500. We gave this bright and amazing girl one of our Mission soccer shirts. We hope to give her cleaner drinking water by the end of the year. The work at each site costs $2,500 and can transform a community. Children no longer have to drink puddle water or walk miles for clean sources, and the village is empowered for greater things. These photos show a spring protector that was sponsored by one of our teams. Much of the work was done by local Agroi men and women. They have a village water manager. They have clean water. Clean water. Healthier children. Hope. We personally saw 15 other remote communities that are in need. If you are interested in sponsoring a site, please contact us at bruckner19123@gmail.com. It's $2,500 (through a 501c3, Surge for Water). This work greatly reduces illnesses in children. It empowers the community. And they engrave a donor plaque and they host a village celebration if you want to visit, and they will probably give you a family chicken. This is a well that was previously drilled, but is barely functioning. It was intended for one community, but when neighboring villages developed dysentery, this well became a source for 3 villages. It needs a significant repair. Very remote. It is not the grossest water on the list, but it serves more people than any well we visited. This man was so excited to see us. He jumped over the dirty spring to greet us. Wearing a Mets sweatshirt and a big smile, he was so appreciative of our visit and concern. This would be a great water source as a protected spring. Alubo is shallow and milky. There was work done on it at one point (note the pipe), but the water was not good. These brothers we met were amazing. Funny and joyful. They came for water after school and left with a Mission Soccer Academy shirt. Enayu was shallow at the edges and incredibly deep in the middle. The main purpose of the wood was to protect children from wading out and slipping into the pit. Awala served a large community until it broke. It is totally out of service. Those who used it have been forced to walk great distances, or to fill their containers from very poor sources. This good man accepted an old UWGB soccer jersey to replace his tattered one. Hopefully we can gift him some clean water next. Please notice the small dog on the log. We want our animals drinking good water, not swimming in drinking water. Otigo is a source for many families. These fun kids were collecting drinking water for their households. This is a site that we hope to protect very soon. Great community need. The Eastern Ugandans are so friendly and joyful. It was humbling to see how little they possessed, but how much they had as a community. The fence is to keep the cows out. Cows shouldn't share our drinking water. 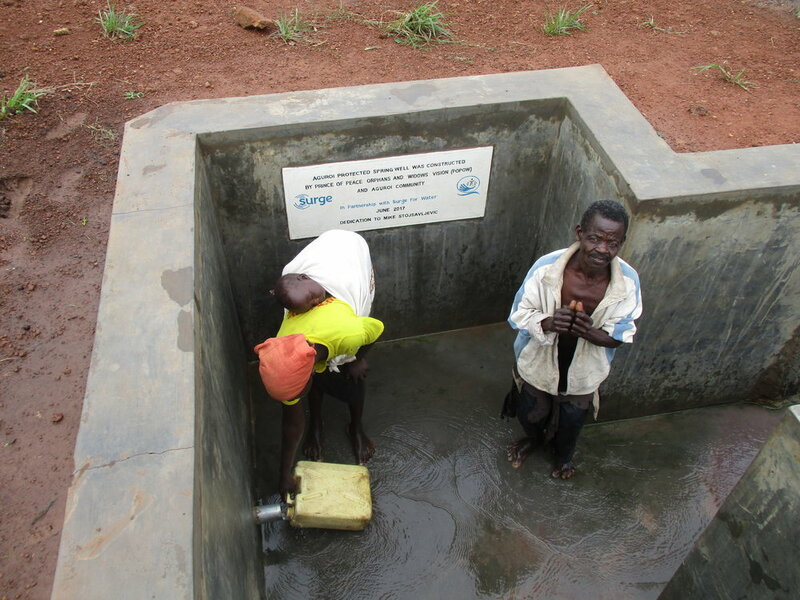 Alunga was the most crowded spring that we saw, and possibly the most fun community we crossed. We are excited to help protect Alunga, but we need some help. 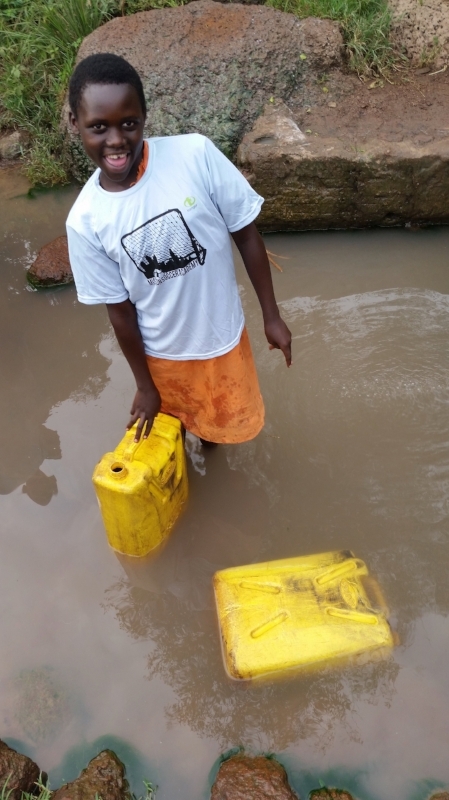 We have cleaner water in our showers and flushed toilet tanks than Ayago has to drink. We don't have an obligation to help, but we have an opportunity. We tested the water at this well and it had some really bad junk in it. The village has been saving money and patching the pipes poorly. It need major repairs, but will get a community back to good health. The locals said that this water is clean in the morning, but milky in the afternoon. The Odogulu Community is in a water crisis according to their local leader. Animals have shared this spring for years. We raced to see this source before sunset on our last night in Uganda, but we didn't make it in time. A flashlight and guide saved the evening. When we arrived there was a young person bathing in the spring. Akorokoc needs a rehab, but has limitless potential.